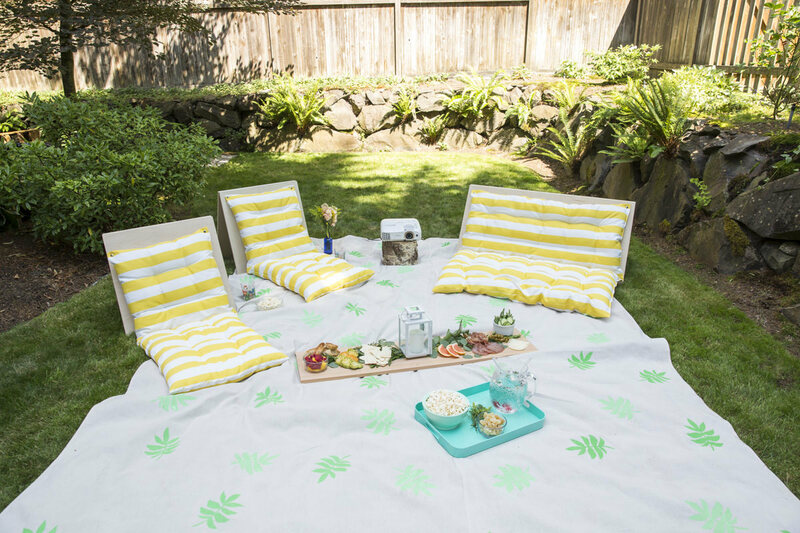 "A canvas picnic blanket is a creative and inexpensive way to make a personalized outdoor throw using artistic expression and simple products." This summer we're celebrating the warm weather by hosting a movie night. This is part two in our four-part series. Last week we made kettle corn and maple bacon kettle corn! 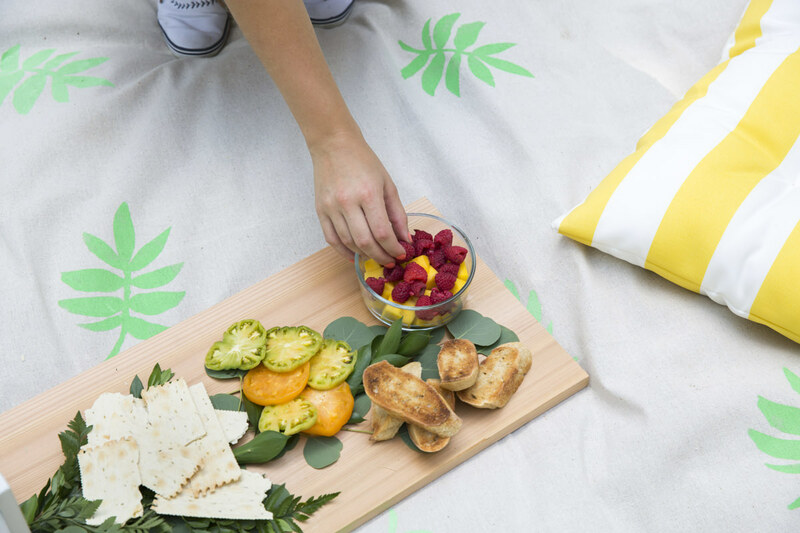 This summer, I’m all about the canvas picnic blanket; it’s a creative and inexpensive way to make a personalized outdoor throw using artistic expression and simple products. 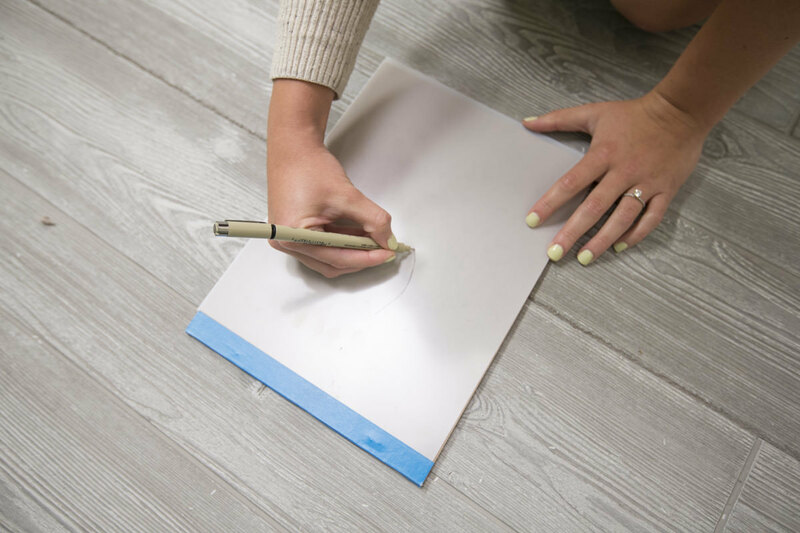 For me, this project is the perfect embodiment of Dunn DIY—it uses construction materials and things you have laying around the house, and combines them with a minimal amount of effort to make something super fun and practical. 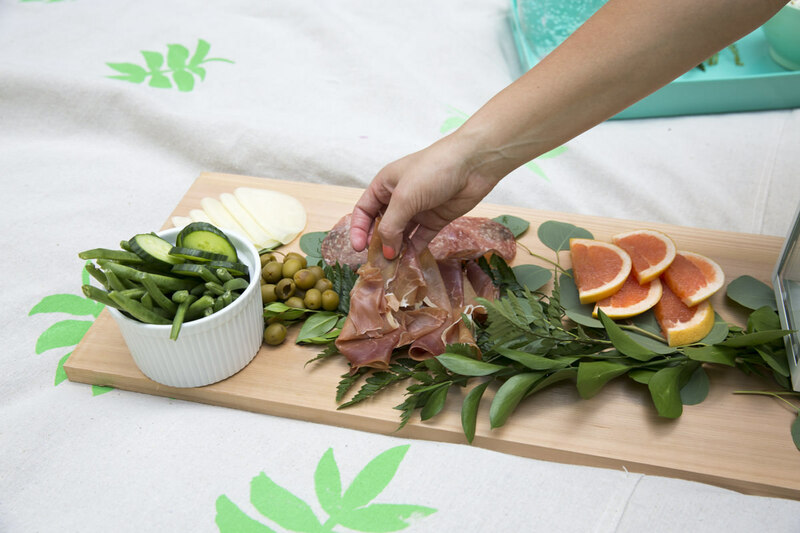 This canvas picnic blanket isn’t just for picnics. You can use it for movie night, beach days, or really any time you want to sit down at a park and hang out. I always keep a blanket in the trunk of my car, but because we live in the Pacific Northwest, the grass is often wet—even on a nice day! What’s great about this project is the canvas drop cloth I used is backed with polyethylene, which means if the ground is wet, you stay dry. When it comes to grabbing any old blanket versus grabbing this water-resistant canvas picnic blanket, I choose the latter. Check out the steps below to make your own! The drop cloth comes folded up, so you’ll want to iron or steam it to smooth out the wrinkles. Since we’re working with a 9' x 12’ drop cloth, I got creative and used two stands to drape the drop cloth while steaming (but you could drape it from anything). Try a shower or curtain rod, or clip it from something elevated. This frees your hands to work with larger sections of the drop cloth at a time. Ironing or steaming isn’t absolutely necessary, but it’ll be harder to paint with wrinkles in the drop cloth. If you’re happy with the way it is, don’t worry about it, but if it’s particularly wrinkled, ironing or steaming will start you off on a good foot. I decided to make my own stencil for this project. I purchased stencil paper at our local craft store, then freehand drew a design on it. You can also trace a design. Next, using a hobby knife (like X-ACTO), I carefully cut out our shape. I recommend using designs that don’t have a ton of small details, as this may make it difficult to prevent paint from seeping underneath. I wanted to go with a fairly simple and straightforward stencil. Palm prints are everywhere lately and I love them, so I was happy with this palm frond design. If you’d rather skip this step, pick up a ready-made stencil at your favorite craft store or online. This is the part of the project that becomes personal to you. You can obviously use a preexisting stencil—no shame!—but creating one yourself makes it uniquely yours and special. The drop cloth I used has a plastic backing that helps prevent liquids from bleeding through. If you’re concerned about protecting the surface you’re working on, roll out plastic under your drop cloth for extra protection. 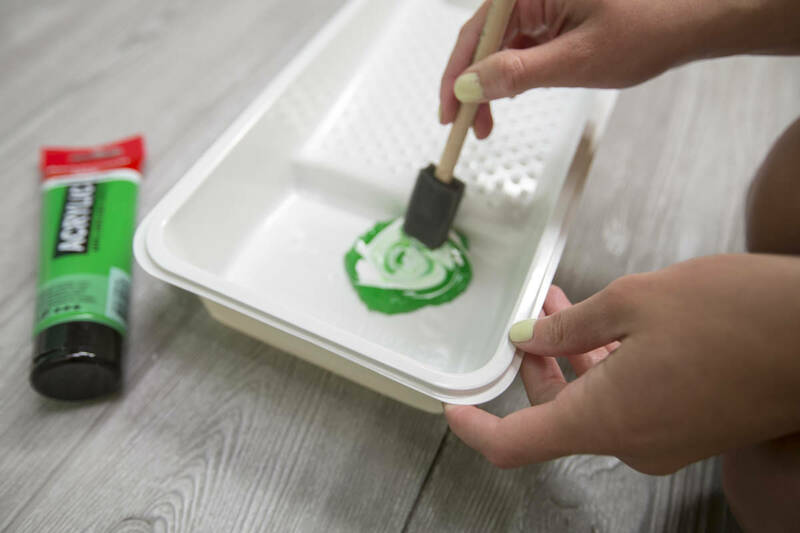 You definitely don’t need it if your only concern is paint seeping through, but plastic works great if you’re worried about spilling paint outside the drop cloth. 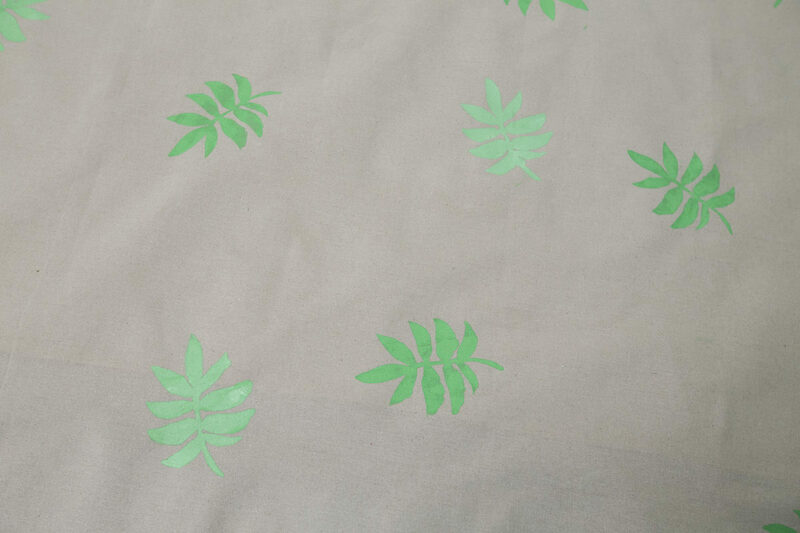 I wanted varying shades of green, so I used one color as a base for half of the stencil pattern, and then used the same color with a little white mixed in to lighten it up for the other half of the stencils. If you want to recreate the colors I used, mix Amsterdam Acrylic Paint in shades #105 (Titanium White) and #618 (Permanent Green Light). Start with a white base and add the green slowly for the lighter color, or start with a green base and add the white slowly for the darker color. These are basic acrylic paints you can pick up pretty much anywhere—nothing fancy about them. Any craft store should have a basic selection. 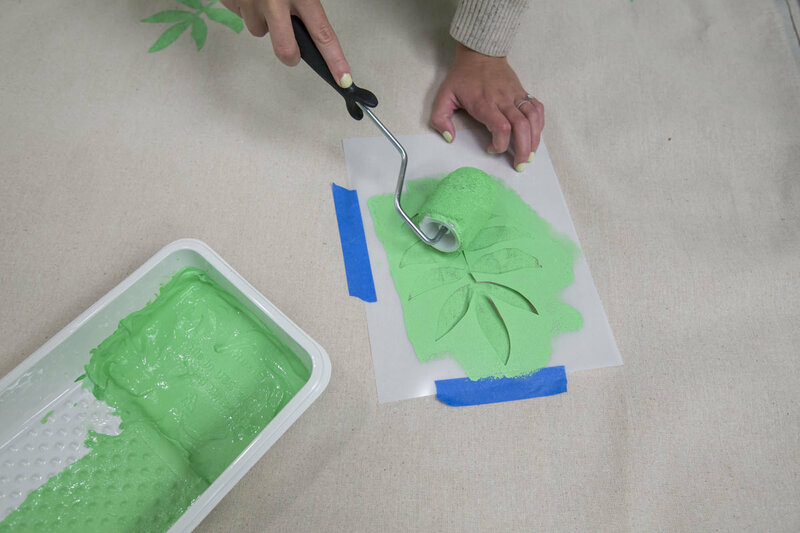 Once your colors are mixed, add one part fabric medium to one part paint. I’d never heard of fabric medium before. It’s a product you add to the paint that makes it more flexible so it will move with the fabric instead of cracking. It’s super easy to use—you just mix it into the paint. Once mixed, it’s a thin, milky substance that changes the texture, but not the color. Take my word for it—you don’t want the drop cloth moving around on you! I used a foam brush and a woven roller to paint in the stencils. I’ve used stencils on a number of different projects, but I’ve never tried using a roller, and I found it was easy to use and goes much quicker, too. For my stencil, I felt like I didn’t have to be too meticulous and I’d still get a good result. 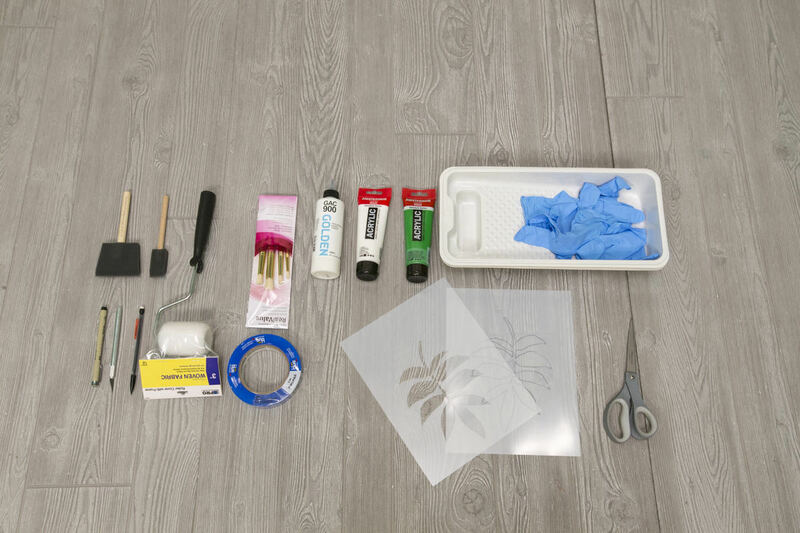 The roller works great for larger stencils that don’t have a lot of edges that could easily lift as you roll. 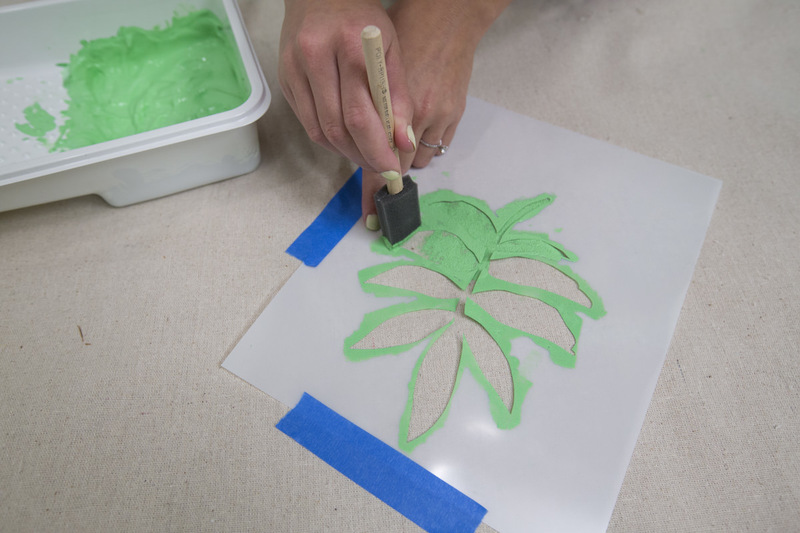 If your stencil is more intricate, try using a foam brush and dabbing the paint onto the drop cloth, being careful to not lift the stencil. 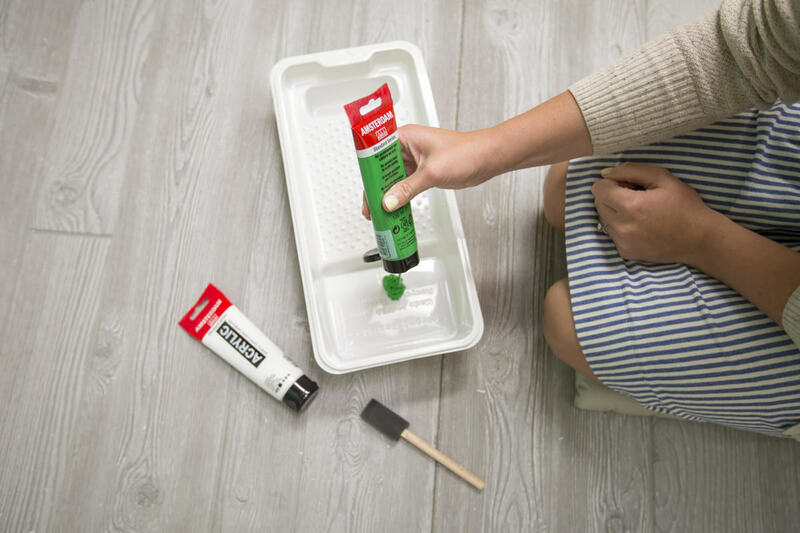 You don’t need to load the brush with a lot of paint; it’s actually helpful to not have a loaded brush to prevent paint seeping under the stencil. 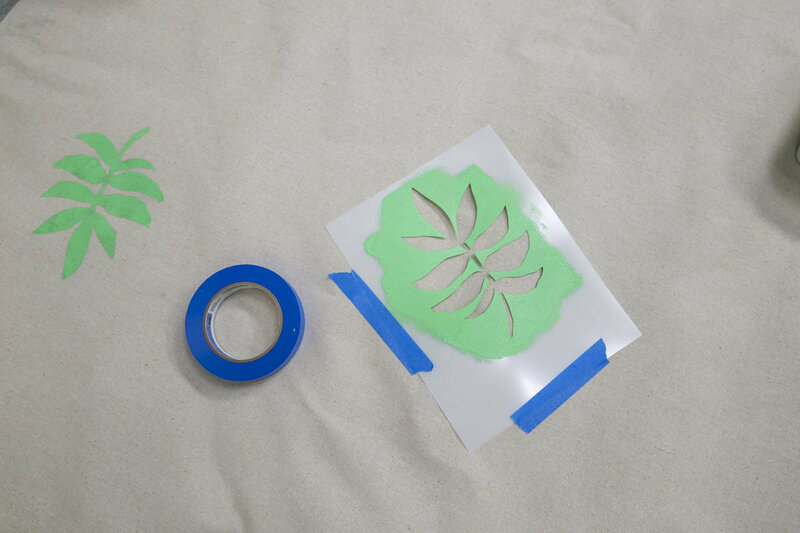 I also found it helpful to give the stencil a quick wipe down between each use. This helps to prevent the residual paint on the back of the stencil from smearing onto the drop cloth. Repeat the stencil across the drop cloth in a pattern that makes you happy. If you’re working with a large drop cloth like ours, it’s helpful to fold the drop cloth in sections and allow each section to dry before moving on to the next. If you remember from the Keds DIY project, acrylic paint only takes 15–20 minutes to dry. Waiting for each section doesn’t mean it’s going to take up your whole day. If your drop cloth doesn’t have a plastic backing like ours and you plan to use this a lot, I recommend heat-setting the paint by ironing on the underside of the fabric (the side with no paint) after the paint has dried. This will further help the fabric grab the paint. This project was super easy and it took a surprising lack of artistic skill. When it comes to painting, I’m always happy about that! And it doesn’t take that long. All in all, I think it’s totally worth the time and effort. It might just have to be the new picnic blanket that lives in the back of my car. A DIY string light project is a simple and affordable way to extend your outdoor living space all year long. A vertical fence is one of the easiest fences to build, and it instantly ups the appeal of your yard while adding privacy to your outdoor living space.